In the weeks following Gabriel's extraordinary, extra-terrestrial experience, Katerina noticed that her new boyfriend's behaviour had taken a rather bizarre turn. To begin with, there was a rather radical change in his diet. Gabriel had never been fond of dairy products: he even took his coffee black. Now, however, Katerina often caught him in the kitchen, even in the early hours of the morning, guzzling down glass after glass of milk. "I thought you didn't like milk?" she once said, after catching him in the middle of one of his late night fridge raids. "What? Don't be silly!" came the amused reply. "Milk's really good for you. Calcium, you know. Good for the bones, and all that." "Then why didn't you ever drink it before?" "Hmm... I don't know. I've just... developed a bit of a taste for it lately, I guess." "Oh, well," Katerina replied, deciding to let the matter slide for now. "Look, I'm getting some cocoa and then I'm going back to bed. Do you want anything?" "I'll have some cocoa too. Wait, actually, don't bother with the cocoa powder - I'll have it without." "So... just hot milk, then?" 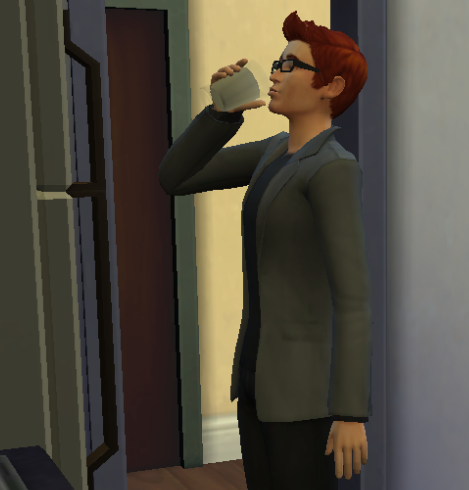 Mind you, the sudden addition of milk wasn't the only change in Gabriel's eating and drinking habits. His appetite, in general, had massively increased. He'd started to help himself to second and even third portions at mealtimes, and at work, he frequently took unofficial breaks to help himself to a little something out of the staff fridge. Naturally, as a consequence of his constant overeating, Gabriel was really piling on the pounds. "Sweet merciful Plumbob, Gabe!" Julian said to him one lunchtime. "Do you really need that third slice of chocolate cake?" "I'm starving!" Gabriel whined in reply. "Besides, my stomach's empty - I threw up first thing this morning. I think I must have food poisoning, or something." Then, there was the behavioral changes. It was true that Katerina appreciated a passionate lover, but she was still shocked to see her shy, timid Gabriel suddenly transformed into an affectionate, lusty Lothario. Most nights, as soon as they got home, Gabriel would take Katerina into his arms, hugging her tightly and showering her with prolonged, passion-filled kisses. It wasn't that she didn't enjoy the whole experience, but it just seemed so out-of-character for him... so unusual... so un-Gabriel like. "What's gotten into you lately?" she asked him. "My darling!" Gabriel replied between kisses. "My sweet, sweet darling. I love you more than life itself, more than the moon and stars. I love you... I need you... don't ever, ever leave me..."
It wasn't exactly the clearest answer to her question, but still... it was something Katerina liked to hear. Truth be told, Gabriel was more aware of the changes he'd been going through than Katerina realised. One Saturday morning, about seven months after the abduction, and whilst Katerina was still asleep, he stood and looked at himself in the bedroom mirror, alarmed by the size and roundness of his belly. It had gotten so much bigger in the last few months, and it showed no signs of slowing down. True, he'd been eating more... but he just felt so hungry all the time. And milk - yuck! Before, he could hardly stand the idea of drinking it. Now, he had it with every single meal. It had become a necessity, a compulsion... a craving. After one last forlorn look at his stomach, Gabriel dressed himself and headed for the living room - only to take a sudden diversion and rush into the bathroom instead. Sweet Plumbob... would the vomiting ever stop? Calmly composing himself, and after splashing his face with some cold water, he headed back into the living room and approached the bookshelf, looking for some decent reading material to pass an hour or two. However, before he could make his choice, a sharp, sudden pain flooded his belly. Gasping, he doubled over in pain... and noticed something truly strange. 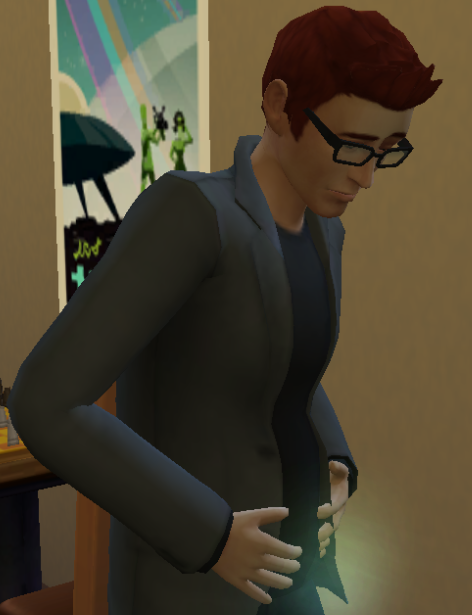 A green, glowing light was coming out of his stomach. At that moment, inside Gabriel's head, everything began to come together. Increased appetite. Increased libido. Morning sickness. Weird cravings. At last, Gabriel finally knew what was wrong with him. And as a result of that, he fainted. Gabriel was very quiet during dinner that evening. Katerina had cooked him noodles and fish fingers covered in chocolate sauce - his favourite dish as of late - and had poured him a nice big glass of milk to go with it. However, Gabriel had barely touched it... he just kept pushing the food around his plate with his fork. Clearly, something was weighing heavy on his mind. "What's wrong, my love?" Katerina asked. "Then why aren't you eating?" "Oh, come on! " Katerina answered, laughing, "Your hunger's been insatiable lately. Don't tell me you've suddenly lost your appetite!" Upon hearing this, Gabriel slammed his cutlery down angrily. "There's nothing wrong with me - OK?!" he snapped, before pushing himself away from the table and storming into the living room, slamming the door behind him. Gabriel ran to the sofa and sat down upon it, curling himself up as best as he could in spite of his big, round tummy. Tears were rolling down his cheeks. He was pregnant. 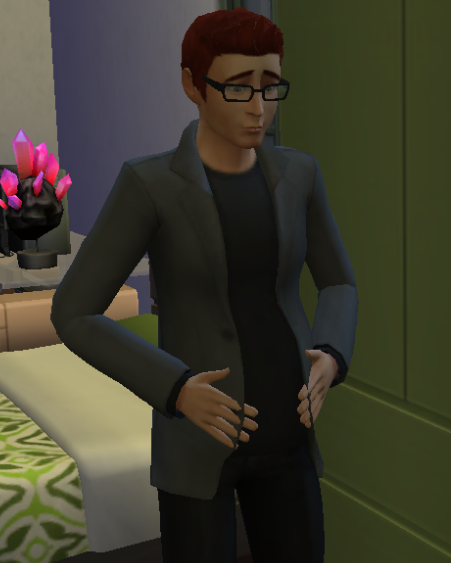 Male, in his mid-twenties... and pregnant. This was what the aliens had done to him. How, he didn't know, but the plain fact was, they had. And he didn't have a clue what to do. How was he going to tell Katerina? Surely she wouldn't able to cope with something as weird as this? If she found out... she'd flip. She'd be horrified. She wouldn't stay in that house another minute. Katerina was the best thing that had ever happened to him. He couldn't face the thought of losing her now. That was it, then. He wouldn't tell her. He wouldn't tell anyone. He'd somehow get through this horrible process alone, have the child in secret, and then find some way to send it back to its homeworld - wherever that might be. No-one would ever need know what had happened. Lost in planning and plotting, he was brought back to reality by a knock on the door. "Darling... it's me," Katerina called out. "Can we talk?" Part of him wanted to say "no"... to make her go away, so she wouldn't see him like this. But if she did go away, who was to say she wouldn't go away for good? That was unimaginable. Thus, reluctantly and nervously, Gabriel got up, went to the door, and let Katerina in. Katerina instantly reached out for Gabriel, gently placing her hands on his shoulders. "Please, darling," she said. "I know there's something wrong. What is it? Please tell me." "Honey, I promise you... nothing is - aarrgh!" He yelled out as yet another pain shot through his abdomen. Once again, he doubled up... and once again, that strange green glow appeared. This time, however, Katerina was also there to see it. "Gabriel!" she cried. "What is it? What's happening to you?" Gabriel looked up at her. Her face was full of care, concern... and love. Perhaps, he thought, even if she knew the truth... she would be willing to stay with him, to help him through it. In fact, had she not promised to do so the night after he'd been abducted? In any case, there was no point denying it now. She'd seen the evidence with her own eyes - even if she didn't know what it all meant. His mind made up, he took a deep breath, then spoke. "I.. I have some big news, darling," he told her. "Big, important news." 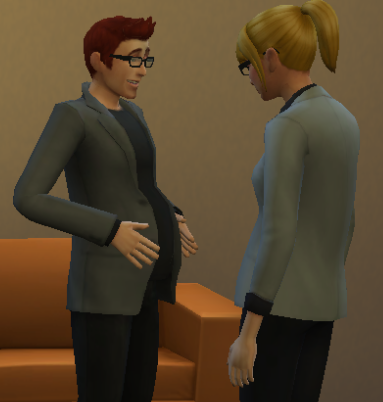 After another deep breath, Gabriel forced himself to smile, and patted his belly proudly. Katerina stared at him, open-mouthed, It was a few moments before she could say anything. "But... but how...?... You're a...?...you haven't a got a... ?... and we've never...?!" "It was the aliens, darling," he told Katerina, taking hold of her hands. "They did this to me. I must be some kind of... Chosen One. Don't you see? My behaviour? My overeating? My illness? They were all symptoms! It's all so clear to me now!" Before Gabriel could answer her, he felt another strange sensation in his stomach. Not pain this time, but... a little sharp tap. As he realised what it was, he chuckled happily. "Oh, yes, darling," he said Katerina. "I'm quite sure... because the baby just kicked." He placed her hands on his stomach, interlocking his fingers with hers. After a few moments, Gabriel's little one kicked again... and Katerina laughed. Gabriel smiled as he giggled again. "You know," he said, "my mother was always very strict with me when I was growing up. She has very strong opinions on illegitimate children. She would kill me if she knew I was about to become an unmarried father!" 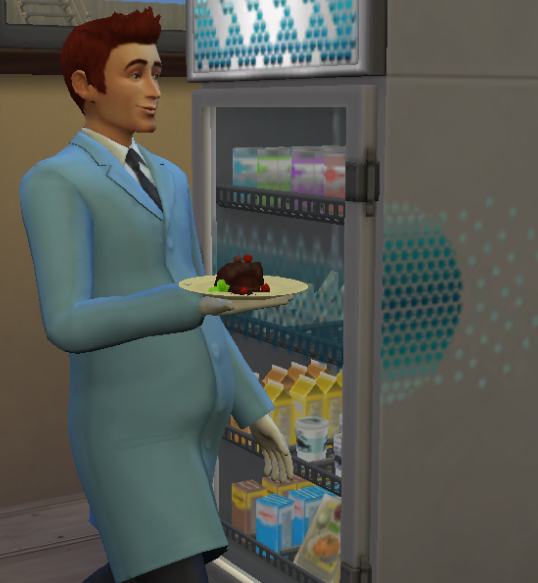 He laughed loudly to himself, amused by the thought of seeing his stern-faced mother coming to visit whatever alien offspring he was about to produce. Katerina was smiling too... but for a very different reason. "Well, then, my darling..." she said, "I guess I'll have to preserve your honour." Gabriel gasped, astounded, as Katerina slowly took her hands away from his baby bump, dropped to her knees, and reached into her pocket - pulling out a beautiful golden ring. 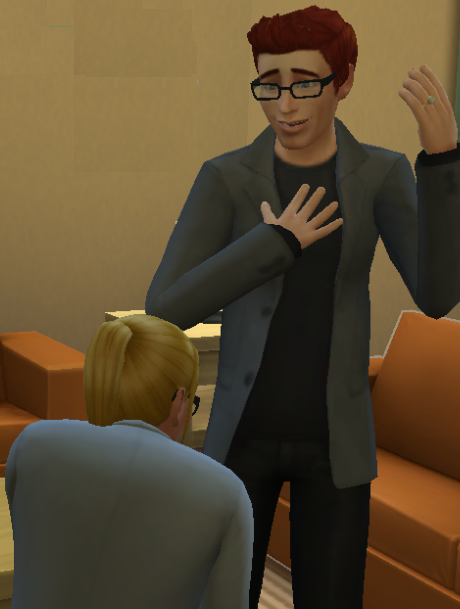 "Gabriel Lee Harker... will you marry me?" Gabriel couldn't reply. He was too busy trying to deal with the additional tears that had suddenly sprung from his eyes. 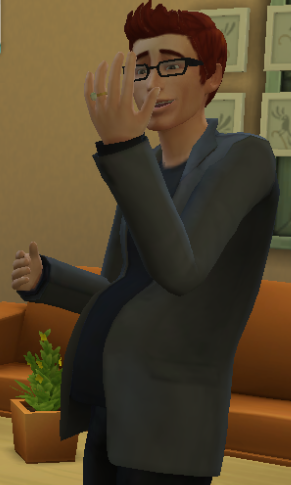 Plumbob darn his pregnancy hormones! "I've been planning this for weeks," Katerina explained. "I was waiting for the right moment to come up, and this seemed like the best time. So... what do you say?" "Yes!" Gabriel shouted. "I'm all yours, Katerina! Always have been! Always will be!" Katerina slid the ring onto Gabriel's left hand, kissing it as she did so. Gabriel's grin widened as he gazed at his new piece of jewellery - something more precious to him than all the diamonds and rubies in existence. "Darling... it's beautiful!" he cried. As Katerina rose to her feet, Gabriel embraced her, and kissed her more passionately then he had ever done before. To avoid drawing unnecessary attention to Gabriel and his "condition", the couple decided it was best to wed in secret. In a small, private ceremony, with two strangers - both sworn to secrecy - as the only witnesses, the two scientists exchanged vows, and pledged themselves to one another for all eternity. Luckily for the newlyweds, the strangers were tourists from Strangetown, and therefore were very used to this kind of thing. The next morning, Gabriel phoned work and told them he was taking a sabbatical - a few months out to work on a private research project. At first, his employers were a little skeptical, but thankfully, Katrina - who continued her work at the lab - was able to provide them with invented, improvised updates about his progress. This little white lie allowed Gabriel to go through the rest of his pregnancy in peaceful privacy, leaving his scientific colleagues none the wiser. The only other person aware of his condition was one Dr. Kailani Jimenez, an acquaintance of Katerina's who worked in the maternity unit of the local hospital. (After all, when the time came, someone would have to deliver Gabriel's baby.) Like the wedding witnesses, she, too, had been sworn to complete secrecy... and she would never dream of comprising her patients' confidentiality, anyway. One night, a few months after their wonderful wedding day, Katerina was woken up by the sound of moaning and groaning from across the room. Slowly, she opened her eyes, and saw a fully-dressed Gabriel stood at the other side of the bed, breathing deeply and clutching his stomach. Gabriel didn't need to say one word to Katerina. Within moments, she was out of bed, throwing on her clothes, and leading her husband to the car.